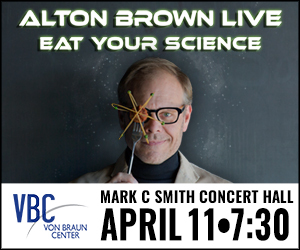 Alton Brown coming to Huntsville April 11, 2016 - Cooking With C.C. Television personality, author and Food Network star Alton Brown, who created a new form of live entertainment with his first live culinary variety show – today announced details for the all new “Alton Brown Live: Eat Your Science” (www.altonbrownlive.com) tour. Beginning in April 2016, the new live show will visit 40 U.S. cities including Huntsville’s Von Braun Center Mark C. Smith Concert Hall on Monday, April 11, 2016. Brown’s first North American tour, “Edible Inevitable” was a huge success over two years and 100 cities with more than 150,000 fans in attendance. With “Eat Your Science,” fans can expect more comedy, talk show antics, multimedia presentations and music (yes, he sings) but Brown is adding a slew of fresh ingredients including new puppets, songs, bigger and potentially more dangerous experiments and what every cook needs in his kitchen: FIRE. Tickets go on sale Friday, Oct. 9th at 10am and available at the VBC Box Office, www.ticketmaster.com or by phone at 800-745-3000. Critics and fans have raved about the interactive component where Brown invites audience members on stage to serve as his assistant. “There will be plenty of new therapy inducing opportunities during our audience participation segments. I don’t want to give too much away, but we’re also going to play a little game with the audience,” says Brown. Brown has a knack for mixing together a perfect base of science, music and food into two hours of pure entertainment. “Plus, you’ll see things that I was never allowed to do on TV.” He also says larger and more protective ponchos will be provided to the first few rows as his experiments have the potential to get messy. Brown, author of the James Beard award winning “I’m Just Here for the Food” and New York Times bestselling sequence “Good Eats,” is releasing the first of two new cookbooks through Ballantine Books (an imprint of Random House) in the Fall of 2016. ALTON BROWN: EVERY DAY COOK, or EDC as Brown calls it, is a collection of more than 100 personal recipes as well as a pinch of science and history. He has hosted numerous series including “Cutthroat Kitchen,” “Camp Cutthroat” and “Iron Chef America” and created, produced and hosted the Peabody award winning series “Good Eats” for 13 years on Food Network; Good Eats can still be seen on the Cooking Channel and Netflix. Information about Alton Brown or the Eat Your Science tour can be found on Facebook: /altonbrown; Twitter: @altonbrown; Instagram: @altonbrown; or use the tour hashtag #AltonBrownLive. Those with an appetite for more Alton Brown can find additional show and ticketing information at www.altonbrownlive.com. Although Alton Brown spent plenty of time in his mom’s kitchen growing up, his real interest in food sparked in college when he discovered that girls who said “no” to dates sometimes said “yes” if he offered to cook for them. His social life may have not ignited, but the food spark did, and after spending a decade behind the camera in the commercial industry, he headed to culinary school in hopes of one day creating a new kind of cooking show. Good Eats, the show that Brown would go on to write, produce, and host ran for 13 straight years on Food Network before making the jump to Cooking Channel where it airs today. Combining food science, pop culture, skit humor, innovative cooking, and the occasional belching puppet, Good Eats has millions of fans and garnered a coveted Peabody award for broadcast excellence.